Roman Burki says there were tears in every player’s eyes after their game against Monaco and says getting on the bus is no longer normal. ROMAN BURKI SAYS he cannot sleep at night in the wake of the attack which hit Borussia Dortmund’s bus on Tuesday night. Three devices exploded near the team bus as they travelled to Signal Iduna Park for the first leg of their Champions League quarter-final with Monaco. Marc Bartra was injured and had to undergo surgery on his wrist, but has since been released from hospital. The Spanish defender said it was the longest few minutes of his life, and Burki has spoken of the more lasting effects of the incident. “The worst are the nights. I still can not sleep and get scared,” he told Bild. Tuesday’s game against Monaco was rescheduled for less than 24 hours later, with Monaco running out 3-2 winners. 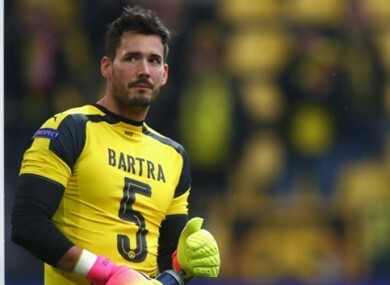 The decision to play the game so soon raised some concerns, and Burki admitted he found it tough to think about around him, but admits playing matches will help them mentally. “I could not concentrate on it. After the game the emotions came right out. There were tears in every player. “It’s good that we have such a tight schedule and I don’t just have to sit on the couch and always have to remember what happened. Even the team’s journeys to the stadium have been affected, with the Switzerland international admitting they no longer feel safe on the bus. “Of course you are totally sensitised. I automatically pay much more attention to noises and looking out the window. The indifference to just getting on the bus is gone. “The only good thing that can be taken from this terrible experience is the fact that we are even closer together as a team. Like the fans with us after the final whistle against Eintracht Frankfurt, we had goosebumps. Email “'Nights are the worst, I can't sleep' - Dortmund 'keeper reveals struggles after bus attack”. Feedback on “'Nights are the worst, I can't sleep' - Dortmund 'keeper reveals struggles after bus attack”.